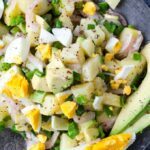 Potato salad, tuna salad, egg salad come together in one salad bowl with this Potato Tuna Egg Salad recipe. This makes a tasty, dairy-free, nutrition packed salad that you can eat for lunch. Simple and easy to make too. Have you started to crave for light lunches these days? That’s how we feel once it gets warmer outside. Although we love salads like Broccoli Apple Salad during winter time, they are mostly side dishes. We need a more filling salad when it is for lunch. 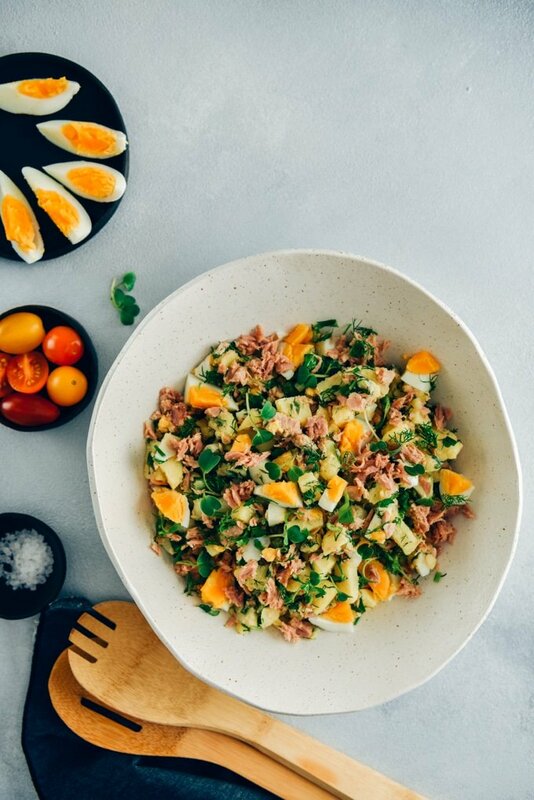 You know a healthy and filling salad calls for protein and this tuna egg salad is a perfect example. Have you ever tried a tuna salad recipe with egg? 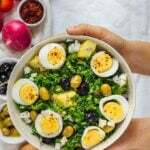 Well, I love to add hard boiled eggs to salads so that they turn into a satisfying lunch and my favorite ingredients to combine with eggs are potatoes and beans. Did you know a typical Turkish Potato Salad contains eggs and is made without mayo? The same for Turkish White Bean Salad. Both are my top go-to salad recipes. On the other hand, making a tuna and egg salad is something new to me. Do you put eggs in tuna salad? After seeing several salad recipes including these two ingredients on Pinterest, I was really intrigued to make my own version, which has to include potatoes. Who doesn’t love potatoes in their salads anyways? As the name suggests, this recipe is a combination of tuna, eggs and potatoes. Besides these three main ingredients, I add a handful of chopped herbs and a simple dressing with olive oil, lemon juice, salt and black pepper. This potato tuna egg salad recipe has four easy parts. First, cook potatoes. To do this, put potatoes in a pot, fill it with water. Bring it to boil and then let it simmer over medium high heat until potatoes are tender enough. You can check their tenderness with a fork. Drain and then wash them under cold water so that they are cool enough to peel. If you use fresh baby potatoes, just leave their skin on. Chop and put them aside to cool completely before combining with the other ingredients. Second, cook eggs. Put them in a saucepan with cold water. Bring it to boil and then cook over medium heat for 5 minutes so that they are hard-boiled. Transfer them into a bowl of cold water to cool. Peel, chop and put aside. Third, combine everything in a large bowl. Chopped potatoes, eggs, tuna and chopped herbs like fresh dill and micro greens. Finally, prepare the dressing. Whisk lemon juice, olive oil, salt and black pepper well. Pour it over the salad and toss gently. It’s ready to serve now! If you want another twist, you can roast the potatoes in oven instead of simply boiling them. Roughly chop potatoes, season with salt, black pepper and thyme. Drizzle with olive oil and mix. Line a baking sheet with parchment paper, place the potatoes and roast in a preheated oven at 400F until tender, about 30 minutes. Make sure potatoes and eggs are cool enough before combining them with the rest of the ingredients. Otherwise, both tuna and herbs will be affected badly. If you want to change the type of carb in the salad, substitute pasta for potatoes to make a delicious salad like this Tuna Macaroni Salad. It will become a perfect alternative to your regular pasta salad this way. I use canned tuna because it is super easy to find and use. 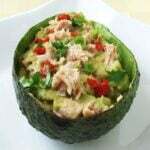 If you want to make it at home, buy tuna fish, cook it in oven, let it cool and then use it in the salad. Is Tuna Fish Salad Recipe With Egg and Potatoes Healthy? Yes, it is super healthy! There is nothing unhealthy in this recipe. What’s more, it’s super tasty! The combination of potatoes, eggs, tuna, herbs and the tangy dressing turns into an incredibly easy and delicious salad recipe. Unlike many tuna salad or egg salad recipes, there is no mayo in this one, so it is much lighter. Yet, it doesn’t lose anything from its wonderful taste. To add even more nutrition, avocado and beans would be the perfect addition. Just use canned white or red beans for a quick recipe. You can add in seasonal fruit just like I do when we make Tuna Salad Without Mayo. They would definitely jazz the salad up. Pickles or celery would also work fine and make the salad even tastier. A little Greek yogurt might add a nice flavor to the dressing and the salad. There are three ways of serving this salad. Serve it in bowls. Combine everything in a large salad bowl and share it in bowls for a quick healthy lunch. Prepare lettuce wraps. Put some salad on each lettuce leaf and serve them as an appetizer. Make A Tuna Egg Salad Sandwich. If you are planning to serve it as a sandwich, it would be better to reduce the amount of potatoes or leave them out. 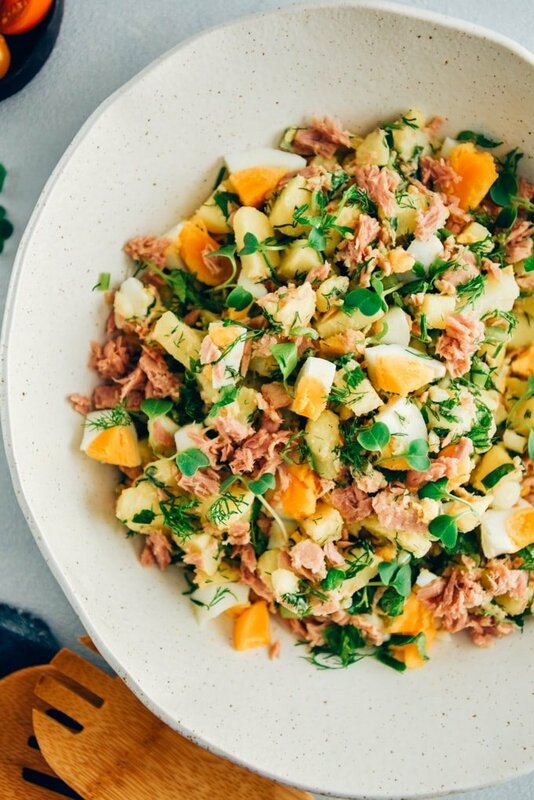 If you make this Potato Tuna Egg Salad Recipe, please don’t forget to rate the recipe and leave a comment below to share your thoughts! Easy, nutrition-packed, healthy salad that combines potatoes, eggs and tuna. Put potatoes in a pot, fill it with water. Bring it to boil and then let it simmer over medium high heat until potatoes are tender. Check their tenderness with a fork. Drain and then wash them under cold water so that they are cool enough to peel. Chop and put them aside to cool completely before combining with the other ingredients. Put eggs in a saucepan with cold water. Bring it to boil and then cook over medium heat for 5 minutes so that they are hard-boiled. Transfer them into a bowl of cold water to cool. Peel, chop and put aside. In a large salad bowl, combine chopped potatoes, eggs, tuna and chopped herbs like fresh dill and micro greens. Prepare the dressing by whisking together lemon juice, olive oil, salt and black pepper well. Pour it over the salad, toss gently and serve. This has become my favorite salad as it has everything I love. I made mine with more herbs and added some pickles.